Goals | If Not Now, When? If you are reading this, hopefully you have done the exercises in Part 1 of this series because we are going to use those steps now. The very first thing I asked you to do was write your goal down or your dream…that thing you want to do, that your heart is aching for you to do, it’s that thing that if you get to do it, you will never feel like you have to work another day in your life because you love doing it so much. If you aren’t sure what that is then here is a simple exercise you can do to figure it out. Go back through your life and find the things you were most passionate about doing, those things that fed your soul, that made you lose track of time, that have been a consistent theme in your life. List those things in your Goal section. So once you have that goal or dream clearly identified go back through the steps to your goal I asked you to write down in no particular order, your brainstorming for your goal. Now I want you to spend some time putting them in order. After you put them in order, you need to fill in between those steps the steps you left out. This needs to be very detailed, a blueprint or map if you will of your heart’s desire. Every little step, the minutia of your dream, because each day from now on, you are going to spend a minimum of 15 minutes on your dream and these steps will guide you in doing that. Now remember I also asked you to make a list of “Why I Shouldn’t”? This list is VERY important so if you haven’t done it yet, stop reading this, sit down in a quiet place and make that list. If you have done that list, let’s talk about it. It is well known that as humans, it is much easier for us to believe the negative about ourselves than the positive. It is also true that if we have people in our lives who don’t necessarily support our dream, they will give us negative messages to try and dissuade us from pursuing them. That desire to dissuade us is usually from a place of “don’t leave me behind” or “don’t do better than me otherwise I’ll look bad or feel bad…” I can tell you right now, right up front you are not going to change their feelings about your endeavor. Only they can change their feelings. We have no control over others feelings or thoughts. All you can do is be true to yourself and stay positive and upbeat. Regarding the list of ‘shouldn’ts’ I want you, over the next few days to take each one of them, and new ones as you remember or think of them, and respond positively to each one. Write a positive counterpoint to the negative. This might seem difficult, maybe impossible but it is vital to your success because those negatives will pop up over and over again and you want to be able to refer back to your excellent list and counter them. Please be very complete and when you draw a blank responding to the negative, just give it some time, don’t rush it. I know all of this might seem very unnecessary to starting on your goal or dream but buildings are not built without a blueprint and nothing that stands the test of time is just thrown together. You will be happy you did all this work. Work on these tasks a little every single day. Our next part to your dream building will be starting to put all the pieces together….Oseola style. Not very many people know about Oseola. She was born in 1908. Her family was poor. When Oseola was in sixth grade her aunt became very ill and needed home care. Since the aunt had no children of her own Oseola quit school and took care of her. She never returned to school. She later became a washerwoman, washing clothes for the people in her town. 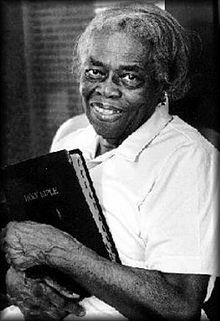 Oseola took her pay and gave 1 dime to her church, 1 dime to each of her three relatives, and set aside in a savings account, 6 dimes to the University of Southern Mississippi. Oseola worked as a washerwoman her whole life, retiring in 1994 because of arthritis. In July 1995 it was announced that Oseola had established a trust for Southern Miss in the amount of $150,000. She accrued this money by slowly, painstakingly saving little amounts of money out of every dollar she took in. This isn’t a lesson about financial management or savings, this is a lesson about never giving up, never losing sight of that goal. Sometimes a goal can be accomplished in days, weeks, months and sometimes that goal will take years to come to fruition. There are other lessons here about how giving helps you get, a lesson about how putting others first means you receive far more than you will ever extend as well…. Oseola’s gift was earmarked for kids who were disadvantaged and could not afford college. She is still giving long after she died. I’ve been teaching Oseola’s life lesson since 1997 in my Joy Is A Choice classes for women in mid-life changes who want to take their lives in a 180 direction. I tell them if Oseola can give .60 cents at a time and create a trust, they can take a goal and by committing a little energy every day to that goal, accomplish great things. Mark Twain said most people miss success because it is dressed up in hard work…and he is right. That consistent, constant effort is what makes the difference in the end, just look at Oseola when you doubt that. If you have a goal…whatever it is…take a blank insert, a very lovely, special one in your Traveler Notebook. Find a label, put it on the front with the title of your goal. Inside, put a header titled: Goal, in a couple pages, Steps to Goal, in a few more pages, Brainstorm, in a four or five pages, Why I shouldn’t (Yes, I said shouldn’t). Then spend some quiet time writing your goal on the first page. As you think of other components or dynamics to your goal record them. After you write out the goal, start listing the steps you need to take to achieve it in the next section. The steps do not need to be in any order at all…they will be re-arranged later…leave room for other steps you think of later on…keep your notebook with you, with pen, because thoughts about your goal are going to pop up at the most random time and I want you to write those very random thoughts in the brainstorm section, additional steps in the appropriate section and ANY negatives that pop up in the ‘why you shouldn’t’ section. Some of those thoughts will later be re-organized in to coming sections. Then, when you have more quiet time, I want you to write in the ‘why I shouldn’t’ section every thought you’ve ever had as to why you cannot go forth with your goal….maybe financial reasons, logistical, space, people, whatever the reason, write them down…this isn’t the place to argue with those reasons or challenge them, simply record them. These can also be negatives others have said to you about your goal. Don’t move on to any other steps until Goals, Steps and Shouldn’t are completely exhausted and filled in….Next week, we will talk about what comes next. I can tell you this process, if you are faithful to it, is going to result in some amazing things happening in your life. Keep watching for Part 2 in Achieving Your Goal, Oseola Style. I have been asked in my workshops by students, ‘How do I know when I’ve arrived…when I’ve ‘fixed’ myself.’ My answer to that is ancora imparo or ‘I am still learning.’ We never stop learning, growing or moving forward. The place you think is an ending to a dream or goal is really only the beginning of a new dream or goal. Personally, I think we never arrive. The very reality of being human invites constant learning, growing, changing and evolving. Every moment we are in gives us the opportunity to change anew and alter who we are. Every person we meet irretrievably alters our lives as we take a part of that person with us. When you think you are finished simply say – ancora imparo. 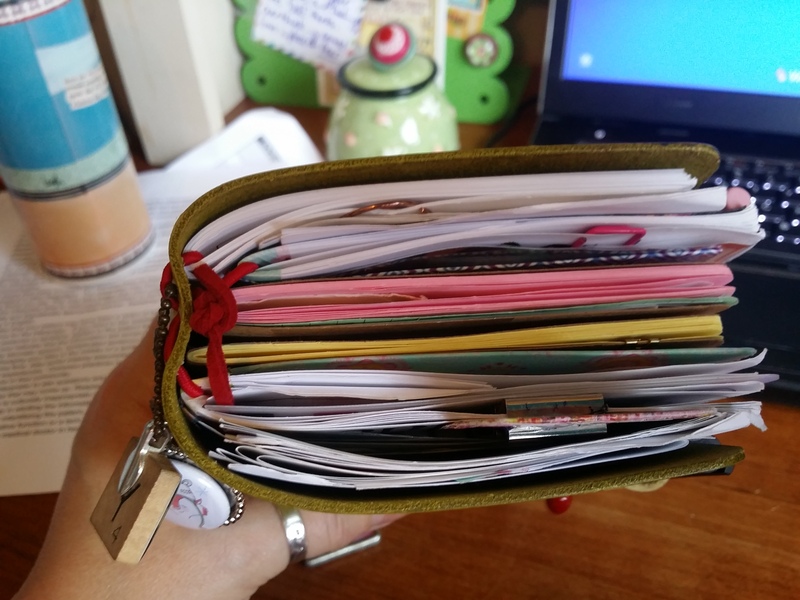 You are probably wondering what the ‘technology’ of the traveler’s notebook could be since it is just leather, cord, and paper….lots of paper. I’ve tried just about every planner out there and almost every planner ‘app’ as well. I stumbled across the brand ‘Midori’ a while ago. Being someone who likes lots of color in her life, the Midori brand didn’t cut it for me….but I really liked the idea of flexibility in the TN. No planner will work if it isn’t used or it is used minimally…then it is just a stack of paper bound by leather. I found a shop on Etsy that made colored TN’s by hand to order. Once I had the FoxyDori in my hands I new I had found the technology I was looking for to pull the different parts of my life together in to one neat amazing bundle. Wikipedia states the definition of technology is: from Greek τέχνη, techne, “art, skill, cunning of hand”; and -λογία is the collection of techniques, methods or processes used in the production of goods or services or in the accomplishment of objectives. That definition fits my Dori perfectly because daily I am able to accomplish my objectives with the help of this tactile leather cover enveloping my dreams, goals, tasks, quotes, recipes, blog ideas and appointments. 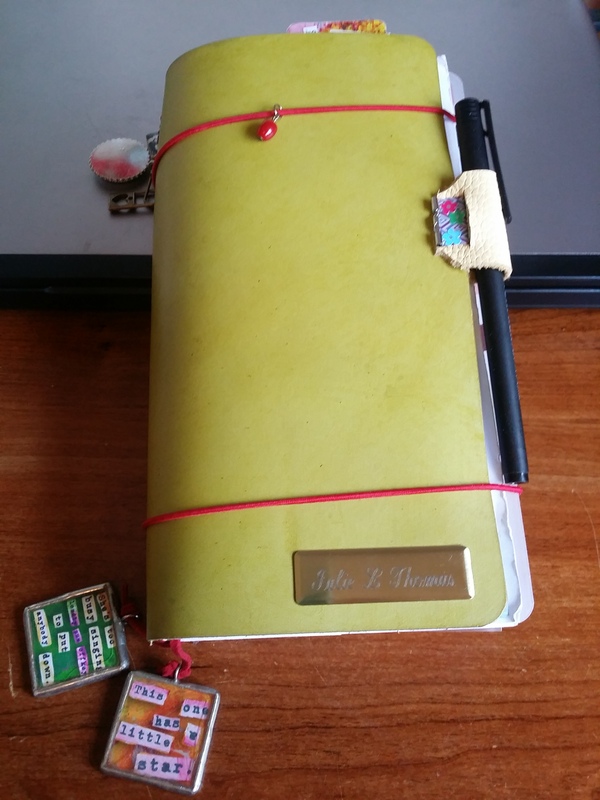 If you use a planner…mosey over to Kelly’s shop on Etsy, FoxyDori and check out what she makes. She doesn’t know I’m telling you about her but you will love what she does…I guarantee it….and you will have a new home for your dreams and goals. If you don’t want color or her cover isn’t exactly what you are looking for a quick search of Traveler’s Notebook, Midori, FauxDori on google or Etsy will help you find other variations.